The Joy Luck Club is divided into four parts of four stories each, totaling sixteen stories in all; in the beginning of each part, a short parable introduces a common theme, connecting the four stories that follow. Each story is told by one of the seven main characters, and these stories are all woven together into a larger narrative about the complex, and often misunderstood, connection between immigrant Chinese mothers and their American-born daughters. A few months after her mother Suyuan’s unexpected death, June Woo is asked to take her mothers seat at a weekly mahjong game that’s been ongoing between four friends for almost forty years. The weekly meeting is known as “the Joy Luck Club,” and the other members are An-mei Hsu, Lindo Jong, and Ying-ying St. Clair. The four women met in a San Francisco refugee center after emigrating from China to the United States during World War II, and bonded over both shared grief and resilience. Suyuan’s particular grief related to the loss of her twin baby girls, whom she was separated from during the Japanese invasion of Kweilin. Suyuan secretly searches for her two daughters for the rest of her life, unbeknownst to June. With Suyuan gone, June is supposed to fill her mother’s role in the group of friends, but June feels childish and out of place at the table of older women, especially when they start talking about their own daughters with whom June grew up. When the game night concludes, the three older women inform her that Suyuan’s twin girls have been found as adults in China; it is up to June to travel to China and fulfill her mother’s lifelong wish of reuniting the family. June worries that she doesn’t know her mother’s personal history well enough to communicate to her long-lost half-sisters, which the older woman strongly deny. This strong denial reveals these women’s own fears: that their daughters would also be unable to articulate their Chinese heritages if asked). In the first part of the novel, An-mei, Lindo, and Ying-ying relate how their traumatic childhoods in China affected their parental styles. An-mei was initially raised by her maternal grandmother, after her mother remarried in a dishonorable manner. When her mother returns a few years later to care for An-mei’s dying grandmother, her mother cuts off a piece of her own arm to brew medicine that might save her grandmother. An-mei witnesses the sacrifice, which redefines her notion of a daughter’s love. Lindo’s life is decided for her by the time she’s two, when a matchmaker arranges a future marriage between her and Tyan-yu, a wealthy but spoiled boy. Lindo moves to Tyan-yu’s family’s mansion when she’s twelve and becomes an indentured servant to Tyan-yu’s cruel mother, Huang Taitai. After she and Tyan-yu marry, Lindo takes fate into her own hands and concocts a plan to scare Huang Taitai into annulling the marriage. When Ying-ying is only four years old she falls off her family’s boat during a Moon Festival and gets separated from them. She soon comes upon the Moon Lady performing on a stage and believes it to be the goddess who grants wishes, as her nanny taught her. However, when she goes to talk to the Moon Lady, Ying-ying is horrified to discover the actor is actually a man dressed as a woman. The fear of being lost finally sinks in, and Ying-ying relates at the end of her story that she is uncertain if she was ever completely found. The second and third parts contain the stories of the older women’s daughters: Waverly Jong, Rose Hsu Jordan, Lena St. Clair, and June again. These stories address their upbringings with immigrant mothers, and the way that maternal wisdom, derived from Chinese tradition, shaped them as adults. Waverly becomes a chess prodigy before she’s ten years old, and thrives under the pressure of competition. Still, she gets irritated by her mother Lindo’s boasting and self-congratulations, and the two have a fight that leads to Waverly quitting chess out of guilt. Lindo’s ability to shake Waverly’s confidence continues into Waverly’s romantic life when she’s an adult. Rose’s stories involve her mother An-mei’s faith to keep trying, despite fate’s cruel circumstances. Rose’s baby brother accidentally drowns while under Rose’s supervision, and An-mei tries to rescue him by appeasing God and Chinese ancestral spirits with prayers and jewelry. Though unsuccessful, An-mei’s attempt inspires Rose to take control of her own fate during her later divorce. Lena remembers her mother Ying-ying’s unnerving ability to predict bad events, and highlights the ominous premonition about her mother’s stillborn baby. Acting as an interpreter between her suffering Chinese mother and her bewildered white father, Lena fails to communicate Ying-ying’s sorrow, leaving her mother bereft and without support. Ying-ying also predicts that Lena will marry a bad man, which comes true years later. Lena senses the impending divorce, but it takes Ying-ying’s presence to help Lena acknowledge her husband’s lack of support. June recalls Suyuan’s desire to make June into a child prodigy like Waverly, which ultimately backfires. For most of her life, June believes her mother thinks she’s a disappointment, until Suyuan holds a New Year’s dinner party right before her passing. During the dinner of whole crabs, which represent good fortune for the next year, Waverly picks the best crabs for her and her family. By the time the plate reaches June and Suyuan, only one perfect crab remains. June tries to take a damaged crab so Suyuan can have the perfect crab, but Suyuan stops her. Later, Suyuan praises June for having such a generous heart when other people (like Waverly) only think of themselves. The final section returns to the mothers’ perspectives, and tries to reconcile the gap between Chinese and American cultures by offering solutions that appease both sets of values. Using old-fashioned superstition to manipulate her abusive husband, An-mei’s mother controls the outcome of An-mei’s fate. Her suicidal plan both acknowledges Chinese customs as well as a new spirit of self-agency. Similarly, Ying-ying identifies with the Chinese Tiger zodiac sign, even if its assigned traits don’t always appear to others. The animal’s resilience motivated Ying-ying to survive her life in China, and Ying-ying believes it can help Lena through her divorce; just because the idea is old-fashioned doesn’t mean it doesn’t apply to American situations. Lindo contemplates her daughter Waverly’s upcoming marriage and the similarities between their life paths, despite growing up in different countries. In the last of the sixteen stories, June flies to China to meet her long-lost half-sisters. Immediately after touching down in Shanghai, June feels a sense of connection to the country, and to her mother, in a more immediate way than ever before. When she finally meets her sisters, Chwun Hwa and Chwun Yu, the three of them feel their mother’s presence together and represent what Chinese heritage really is: a connection to family and a greater cultural legacy that transcends place and time. Ogi, Alyssa. "The Joy Luck Club Plot Summary." LitCharts. LitCharts LLC, 24 Jul 2015. Web. 17 Apr 2019. Ogi, Alyssa. "The Joy Luck Club Plot Summary." LitCharts LLC, July 24, 2015. 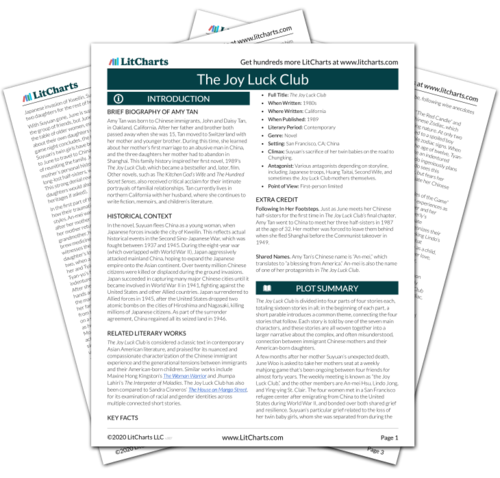 Retrieved April 17, 2019. https://www.litcharts.com/lit/the-joy-luck-club/summary.